Today’s Tid-Bit is another aphorism. Remember, those are those types of sayings that people often use as a piece of advice or as an annoying way of trying to tell you what to do… or worse yet, as a way of saying that you should have done something differently than you did. And today’s little saying is a way of telling someone (usually after it’s already too late) to not take on too much responsibility or to not do some act that is beyond the physical and/or mental capabilities of the person that the statement is directed to. And What About This Aphorism? …then that person (or animal) will end up in a difficult situation and/or will end-up wasting what-ever it is that He or She is chewing. 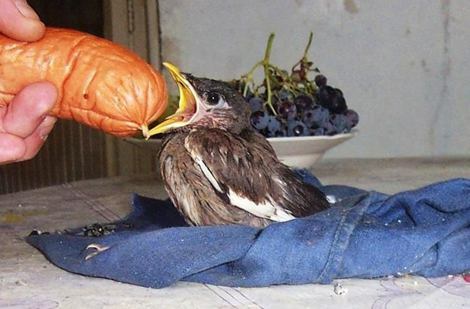 Um… Dude… That’s a gigantic hot-dog and a baby bird… those two things do not go together!